Yet another new launch by Sony Ericsson is in the category of Smart phones Symbian series- Sony Ericsson Vivaz Pro.. This new Smart phone has a very stylish and iconic look to attract the people. The huge look of Sony Ericsson Vivaz make it suitable for men use. Varied features also adds icing to the cake for this mobile like QWERTY keyboard, Accelerometer sensor for auto-rotate, Full QWERTY keyboard and Scratch-resistant surface. Feature of this extraordinary stylish mobiles are as follows. 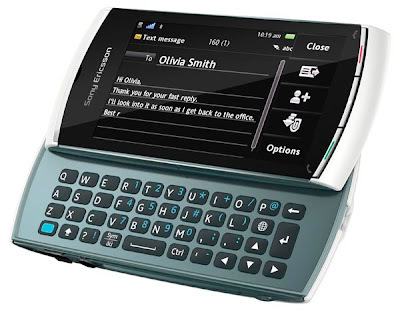 * Mobile type- Sony Ericsson Vivaz Pro * Screen Type- 3.2 inch TFT resistive touchscreen to cover area of 320 x 480 and 16 M colours * Weight and Dimensions- 117 gms with 109 x 52 x 15 mm * Music- Radio Fm, MP3 and MP4 * Camera- 5 Mp with a resolution up to 2560 x 1920 pixels with auto focus, LED flash, Touch focus, Geo-tagging, face and smile detection. * Internet Browsing-In built browser in the configuration of WAP 2.0/xHTML,HTML. * Memory- Inbuilt memory of 75 MB with micro SD slots and can be extended to 16 GB. * Battery Life- Lithium ion with a talk time of 12.30 hrs. * Network- 2Wi-Fi 802.11 b/g, DLNA and the 3G is there as HSDPA; HSUPA. * Connectivity-GPRS is in the configuration of Class 10 (4 1/3 2 slots), 32 - 48 kbps and the EDGE in Class 10, 236.8 kbps. * Price- Rs.27000- 32000.